Simplio3D is a highly customizable web based product configurator developed for any type of project. The key advantage of Simplio3D technology is in it’s modular based library with elements called SEL (Simplio Elements Library). The SEL modules offer the possibility to develop customized product configurators at an affordable cost and faster time delivery. This is made possible by using pre developed key elements that are ready to be used on a product configurator. 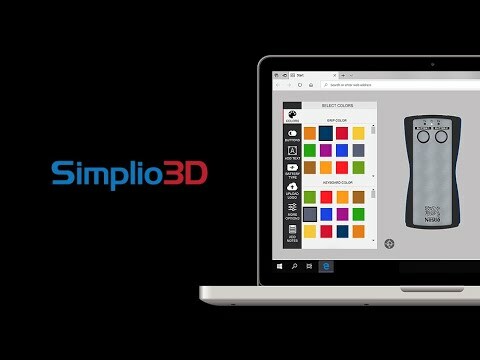 Simplio3D is special developed to meet the requirements for any type of configurator especially the ones that requires integration with known ecommerce platforms. Integration with an ecommerce website can be found in many forms, the SEL product configurator technology allows developers to accommodate a product configurator exactly how the client wants. Despite the name, Simplio3D can support both 2D and 3D visualization rendering. The product configurator is fully responsive, mobile-friendly, equipped with the latest technology such as: pixi.js for 2D rendering, three.js for 3D visualization and ecommerce compatible with: Magento, WooCommerce, Shopify, Opencart and PrestShop. Digital Artflow is very responsive and helpful with all of my requests.Digital Artflow has been a great addition to my web pages. Because of the 3D images Digital Artflow created, many custom box orders have been received. Thank you Digital Artflow for the Rotatable 3D images that help my customer visualize their purchases. Digital Artflow has been a great addition to my web pages. Because of the 3D images Digital Artflow created, many custom box orders have been received. Thank you Digital Artflow for the Rotatable 3D images that help my customer visualize their purchases. I have many mare products that someday I could have Digital Artflow create even more interactive 3D product visualizations. You need a developer if you want to do more than what standard version does, but Simplio3D staff provides additional services for those who want customizations and integration with eCommerce websites. Great product configurator, especially for those who do not have technical skills.Easy to install and user friendly design tool. Excelent documentation and technical support for developers. Easy to install and user friendly design tool. Excelent documentation and technical support for developers. Seems that is not very easy to upgrade as you risk to override customized files. It was nice if they had a better way to provide upgrades. We don't have a technical staff to handle installation and the needed customization for the software. Hence we loved the fact that Simplio3D also provides a full package with everything needed to fully deploy the software in good conditions. This includes: installation, branding, support and image rendering service of our products. Affordable, simple and quick way to deploy a web site product configurator. Just perfect for some of my customers that don't want something elaborate, able to generate dynamic images and generate leads. The last version it's quite fast in terms of loading using minimal server resources. Works well with PayPal if you want to finalize payments. Despite the name, Simplio3D is not really a 3D application rather you can upload images and generate angles for each image and gives the impression of a real 3D perspective view. The company can adapt a real 3D perspective view but under customization and it's not found in the standard version, yet. Includes: installation, branding & 6 month support. - SEL is a powerful and modular product configurator using predefined key elements that can be easily customized. - High degree of customization especially for advanced integrations with ecommerce platforms. - Customized product configurator at an affordable cost and faster time delivery. - SEL can be easily improved/modified by other developers, other than our agency. Below are some frequently asked questions for Simplio3D. Q. What type of pricing plans does Simplio3D offer? Q. Who are the typical users of Simplio3D? Q. What languages does Simplio3D support? Q. Does Simplio3D support mobile devices? Q. Does Simplio3D offer an API? No, Simplio3D does not have an API available. Q. What other apps does Simplio3D integrate with? Q. What level of support does Simplio3D offer?